Richard Kaufman has written: The Ambitious Card* is like the menu in a Chinese Restaurant: one from column a and two from column B for me and two from column a and one from column B for you" i think this approach is a recipe for failure. Like any other multi-phase routine, The Ambitious Card needs focus, a sense of progression, and the proper mix of different methods to produce the same effect. My friend Bernard Bilis was the first to point out to me that many Ambitious Card routines lack focus. If, in one phase the card comes to the top of the deck, in the next it goes to the bottom, and in the last it goes to your pocket, you shouldn't be surprised if the audience is left wondering what the effect is. Furthermore, they y may feel that you only succeeded in fooling them because you caught them by surprise each time by continually changing the ground rules. My routine is designed to convince the audience of two simple, precise, and impossible claims: first, that I can make a card jump from the center of the deck to the top; second, that the card jumps at the moment that I flick my wrist. The first three phases concentrate on proving the first point. The last three locus on proving the second. The handling for Monkey in the Middle I describe above is different from the one that comes with the instructions. You can just as easily use this handling if you choose to perform the Goldman effect by itself. The practical advantage is that, unlike the original, it doesn't require secretly adding a gaffed card to the deck prior to starting the effect. The idea of using a push-in change and leaving the card outjogged also offers advantages from the standpoint of conviction. Consider the alternatives. Some handlings for this fine effect involve the classic pick-a-card-and' lose-it-in-the-deck approach. Others involve having the spectator name a card. Suppose we apply the must-helieve test to this effect. 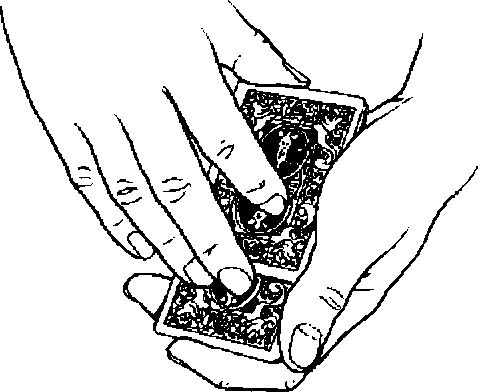 Having a card selected and controlling it by means of a shuffle or cut sequence implies that what the audience must believe for the trick to be a miracle is that the performer does not know the identity of the card. Having a card named and controlling it by means of a memorized stack implies that what the audience must believe for the trick to be a miracle is that the performer does not know the location of the card. Neither of these is true. What the audience must believe in order for this particular effect to be a miracle is that the selected card is in the middle oi the deck. If they're convinced of that, it doesn't matter whether they think you know either the identity or the location of the card. My handling focuses on convincing the audience that the card is in the middle of the deck. If you want to use my handling for the Goldman effect alone rather than in the context of an Ambitious Card routine, simply have a card selected using the center double lift approach I explain in Fastest Gun Alive. This leaves you in position to go into the push-in change.